I did a first cut prototype of a heat exchanger that extracts heat from our clothes dryer exhaust and uses the recovered heat for space heating. So, this is a brief description of the prototype followed by some questions dealing with how to make it more efficient. This is just a prototype -- its made out of scrap material I had on hand. 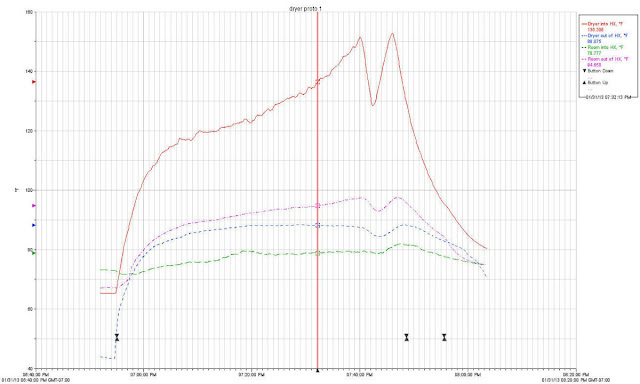 I wanted to investigate what the real heat recovery potential is and to see how bad potential problems such as lint, water, excessive pressure drop might be. This is a picture of the made from scrap heat exchanger. It is a stack of 14 twinwall polycarbonate glazing panels that are spaced apart by 1/4 inch. The dryer air (red and blue arrows above) flows up through the spaces between the twinwall sheets and the room air (green arrows) is drawn in by the fan on top and pushed down through the cells in the twinwall. This provides about 130 sf of heat exchange area. The plot above shows a log of heat exchanger inlet and outlet temperatures for the two flows for a good sized load of laundry. In its current state, it works pretty well. At the marked location dryer air enters at 136F and exits at 88 F, and the room air enters at 79F and leaves at 95 F.
The recovered heat is equivalent to about 32% of the electricity that the dryer uses to do the load. There are a few simple changes that might improve this that are discussed at the details link below. So, not so bad for a first try? Pressure drop through the exchanger is low and does not affect dryer operation. Lint is near non-existent so far, and appears to be a very workable problem. Oddly, very little water or condensation is produced. The pictures in the details link below show what happens -- basically just a little fog in places and a drop or two. This is a good news - bad news thing. Good in that less water will be easier on the exchanger materials, but bad in that the heat used to evaporate the water in the dryer is not being recovered, and this is about half of the heat. It dawned on me that if the exchanger could be changed so that it condensed out most of the water in the dryer airstream, then 1) you recover the heat that was used to evaporate the water, and 2) you could likely vent electric dryers inside (with a good lint filter). The number 2 item is a big one in that it prevents the dryer from pulling in outside air that needs to be heated by your furnace. On cold winter days, this can be about as much energy as the dryer uses in electricity. 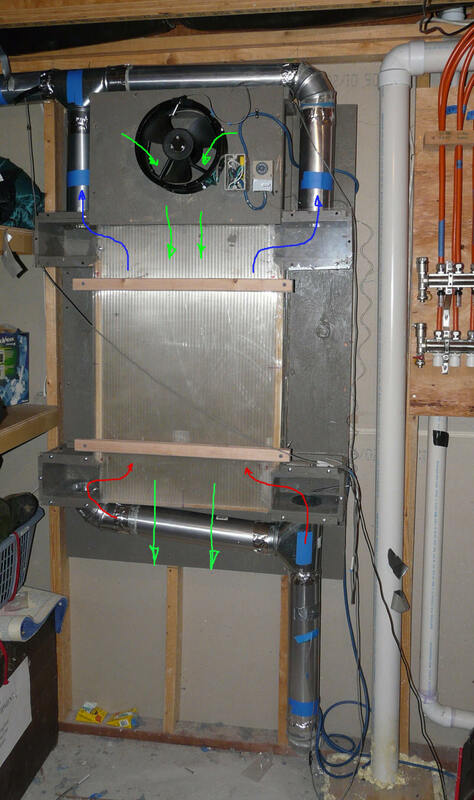 By my numbers, a dryer/heat exchanger set up to do the above could save 80% of the total (electric + HVAC) energy used. This would be a 1000 KWH saving per year for some families. So, if you have a moment, please look over the details link below and see if you can figure out: 1) why the current version condenses out so little water, and 2) what could be changed to condense out a large fraction of the water in the dryer exhaust. I've always wanted to find a way to recover heat from a dryer (safely). This is really exciting! Thanks for sharing. My experiment would be to make a tube of plastic film--3 ft dia--( 10 ft flat sheet) as long as possible.Fold and staple-- Hang it with the cold end down --sloped--over a bucket and punch some drain holes. --Open the discharge end so that the bag inflates but restricts the flow as little as possible. It dosen't need to be round. Long oblong would work. This should give you a hundred or more feet of surface area and collect the lint on the wet inside. The bag could be washed out or just thrown away when linted. Hazards--the finest lint may escape and --fire. Interesting idea -- will think about that. Poly ducts are available and used a lot for AG building ventilation, so no need to make them. Space seems like it might be a problem. Hi, seen from Europe, this look mad... Can't you just store your dryer and save the energy it use? We dry our clothes in the living room during the winter, everyone do that here, cost zero energy. Dryers are pretty well embedded in the US -- not saying that is good, but there are 85 million of them out there, and people are reluctant to part with them. Drying clothes in your living space is not really energy free in that the heat for evaporation comes from the living space air, and in the winter this heat has to be replaced. All the extra heat needed to dry clothes hung in a house isn't lost though. some of it is captured when the water condenses on the windows , or, in the insulation. Most is probably lost to building air leakage. If you live in a heat provided apt. building, why would you care? I came from a house of 6 and there were tons of clothes that would need dried taking a lot of space... and a dryer is more convenient. So if cost effective why not recapture instead of waste the generated heat? Obviously some stand to gain more benefit than others on any project. Thanks for sharing that's a neat idea. That much extra humidity that comes from the clothes can cause severe problems. From mold and health issues up to destroy the insulation of the house. Even the little houses with a vapor barrier installed cannot handle tha much moist. Drying outside is the alternative. NOT inside!! Someone has to pay for that heat the apartment provides. If the apt pays too much, they might raise the rent. There is no might. If the profitability of the structure declines the price of rent will increase or the lease terms changed. If local market rates make rent increase unfeasible the property owner will simply invest the cost to divide metering and change lease terms at renewal. Either way, it's a foolish tenant who thinks the building owner "pays" for anything. I've used one for years. For those of us in cold climates, the extra humidity it ads to the house is a blessing. I empty the lint trap every couple of weeks or so. Once it starts to warm up, just flip the lever and its back to exhausting outside. What difference would it make to draw cooler air from outside the home? Your comment that if the room temperature was lower before the HX you could extrapolate more heat from the air produced by the dryer. This immediately drew my attention to the "B" vents commonly used in gas stoves and fireplaces. Where it draws air from outside, heats it, then vents it back outside. I don't know what this would do for your calculations considering part of your accounted energy savings is having to use air that was already conditioned by the primary heating/cooling source. Are those calculations accounting for the conditioning taking place before or the savings of conditioning taken place after the HX? Also, by using colder intake temperatures from outside, I would be willing to believe you may draw more condensation due to a larger temperature differential. Just some thoughts. Love your ingenuity, keep up the good work! What I envisioned if using outside air for the room side of the HX is that the air would come from outside, run through the HX, and then be vented into the room. So, it might come in at 30F and leave the HX warmer, but probably not up to room temperature (just going by the test results). If you take the air from the room and run it through the HX it comes out above room temp and heats the room. But, as you say, taking the air from outside condenses more water and that's a win. As you say, you could take the air from outside, run it through the HX and then exhaust it back outside. I'm liking that in that you could probably condense enough water out of the dryer airstream so that it could just be vented inside -- so it would not be pulling cold air into the house as it vents outside. This seems worth a try to me. If I did continue to exhaust the dryer air outside, and take the inlet air for the room side of the HX from outside and vent the room side inside (say to the laundry room), then this could supply the air that the dryer would otherwise have pulled from outside, and since it would be preheated that would be a gain in addition to the condensing water gain. Also seems worth a try? I'd like to take your comment and copy it over to the comments section on this page: http://www.builditsolar.com/Experimental/DryerHX/DryerHXTest1.htm if that's OK with you? Gary, you can move my comment. Good luck with the experiment. It would be Awesome if there was a cost effective condensing unit to extract the heat and moisture from regular dryers. I for one am not willing to totaly give up this convenience but in AK it would be great not to have to vent outside and let in all that cold. But who can afford a condensing dryer or has the 4 hrs to dry a load? Just a thought, would using galvanized sheet metal, insulated with panel type insulation provide a better heat exchange? I was actually going to build that one, but ran across the one in the Dutch paper that used twinwall that showed good efficiency, and I had quite a bit of used twinwall so I did that one. But, in the end, I think either construction can give good results. I've been looking into this for a while myself and love the way your design looks installed on the wall. In my research I found that a cross flow air to air exchanger is capable of being the most effficient. There's a good writeup on Wikipedia. http://en.wikipedia.org/wiki/Heat_recovery_ventilation . To condense the most water out, and to account for the fact gas fired dryers must vent to the outside since they have exaust in the air they put out, it's more practical to vent outside. Using a crossflow design you get the advantage of pulling the cold (and very dry) air in and stealing almost all the heat from the exaust before it gets vented outside. This air is now preheated to close to what the dryer needs if you port it directly to the intake of the dryer. The dryer will cycle it's heat cycle less often to heat the very dry warm air and thereby save energy. It's basically the same as you have done, but it makes the airflow a closed system. And it's more efficient to port exaust outside all year long. In the winter, you get the very dry air and transfer most energy to it before running it into the dryer. The air that leaves the house is now nearly as cold as outside and losing very little heat energy. The other big savings of bring in the cold air and porting it from outside to the dryer intake is of course not having the pressure differential of the dryer pushing air out causing air to come in all the gaps in the house. Much of the energy cost of a dryer in summer and winter is that it pulls outside air into the house, and makes it the problem of the central system instead of using it intelligently. In the summer, you pull in air that is usually warmer than inside temperatures and the dryer doesn't have to work as hard to heat the air. Again, you aren't causing the AC to have to cool the air since you send it right back out. The only bad part here is that in humid hot areas, the air may not be able to pick up as much water as the conditioned house air might do. Summer humidity would have to be taken into consideration in any calculations. Thanks again for posting this. I have a strange obsession with simple heat exchange technologies. I'd like to add that a good washer can save quite a bit of dryer energy by spinning the clothes very dry before they even get in there. That's an often overlooked energy factor. The reason you're not finding much condensate is the source air outlet temperature is sufficiently to retain all the water. I've venture the guess that your environmental input temp, 79'F, is likely high enough to retain 90%+ of the moisture. Unless the source air gets below dew point you won't get much water out of it. Only me see that above error?? How can the dryer air leave the hrv colder than the room air exhaust ?? It does no make sense! That is exactly how counter flow heat exchangers work. The two flows are in opposite directions. Go have a look at the the definition of counter flow heat exchanger.